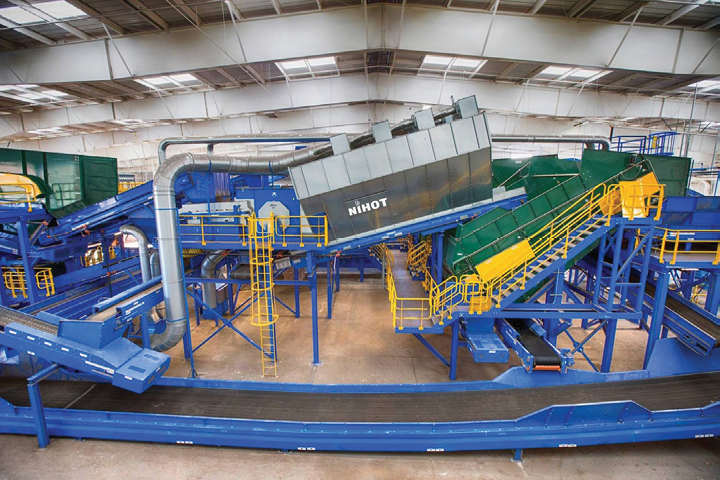 After opening its MRF in the wake of National Sword, the Monterey Regional Waste Management District is adapting to industry changes. If you polled recyclers on the most inopportune time to open a new material recovery facility (MRF) over the last several decades, early 2018 would surely be high on the list. China’s comprehensive recycling ban imposed by its National Sword policy was put into effect in January of last year, wiping out the lion’s share of domestic recyclers’ No. 1 market overnight. Stockpiling material and plummeting commodity prices ensued across the country. Those were challenges the Monterey Regional Waste Management District (MRWMD) faced as it opened the doors to its newly renovated $24 million, 100,000-square-foot facility in February 2018 that was constructed to process single-stream recycling, construction and demolition (C&D) debris and mixed commercial waste. The MRF is part of MRWMD’s comprehensive waste management infrastructure that includes a landfill, a reuse store and composting and anaerobic digestion sites. According to Tim Brownell, the director of operations at Monterey Regional Waste Management District, it quickly became obvious that the changes in the market were going to have a profound effect on the MRF’s bottom line. According to Brownell, the half-percent contamination thresholds imposed by the China ban required the facility to rethink its strategy for handling incoming material. To help improve purity rates, the facility brought in more manual sorting personnel to assist with the recycling efforts. Beyond the contamination thresholds that required unanticipated vigilance, Brownell says the facility was also being tasked with handling unforeseen volumes. The facility is on pace to process 60,000-65,000 tons of single-stream recycling a year—four times more than the 15,000 annual tons they expected when opening. Although the China ban diminished the price of some materials and facilitated the need to hire more staff, Brownell says the increase in volume that the facility has been processing has allowed the MRWMD to meet its original revenue projections through new and familiar end markets. The predominance of the fiber generated by MRWMD—mixed paper, office paper and corrugated—is still getting exported but very little is going to China. Brownell says the majority of these materials are now shipping to Vietnam, Thailand, Taiwan and Indonesia. Conversely, Brownell says the majority of the plastics (separated PET, HDPE, clear and colored, and a No. 5 polypropylene grade) that are sorted on-site, as well as the metals generated at the plant, are shipped domestically. The exception is a mixed rigid plastics grade composed of mostly HDPE that is being shipped internationally, most recently to Taiwan. The facility has both a C&D line and a single-stream line that also accommodates some mixed solid waste processing. On the C&D line, the MRF processes between 65,000 and 70,000 tons per year at a recovery rate slightly over 65 percent. On the single-stream and mixed solid waste line, they’re processing roughly 65,000 tons per year with a 70 percent recovery rate. The recycling line features bag breaking and screen technology from Bulk Handling Systems (BHS), Eugene, Oregon, that work together to filter incoming materials and present consistently sized fractions to the plant’s single-drum separators from Nihot, Amsterdam, which remove contamination from the fiber and container streams. A FiberPure optical sorter from National Recovery Technologies (NRT), Nashville, Tennessee, sorts either plastic film or paper, depending on the material stream and the operator’s discretion, and recovers various types of plastics as needed, based on their marketability. 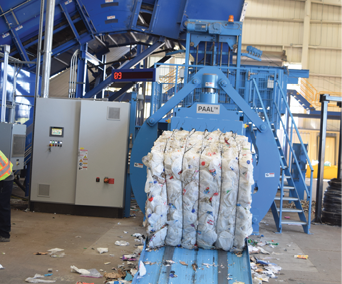 MRWMD bales recyclables with a PAAL Konti baler from Kadant, Westford, Massachusetts. Brownell says that while the combination of new equipment and increased staffing has allowed the plant to better sort incoming materials, the stricter regulations facing the industry have also forced the plant to put a greater emphasis on training. Brownell says that in addition to training staff, residents and haulers in the community need to be part of the solution to help bring about a higher standard of quality in the post-China-ban age of recycling. To help educate those in the community about what can and can’t be recycled, MRWMD has launched a year-long awareness campaign to get messaging out via local newspapers and other publications. The district is also releasing an app, “What Goes Where,” to help the community understand what can be placed in the blue bin. Brownell says haulers also need to recognize the changing economics of recycling. He says charging in accordance with these costs can help a program succeed. Brownell says the district is working with the haulers that deliver materials to the plant to establish tip and processing fees that recognize quality. This processing fee would be based, in part, upon contamination of incoming single-stream materials above 10 percent. For every percentage point above that, haulers would have to pay a little more. “We’re trying to create financial incentives to the hauling community to bring us cleaner materials,” Brownell says. Though MRWMD doesn’t have any plans for upgrades at this point, Brownell says he expects discussions over the next year on the merits of incorporating additional optical sorters to target film and flat plastics on the plant’s fiber streams and additional sizing screens to capture smaller grades of brown paper from its mixed paper line. Brownell says that as the industry works to figure out how to best solve the challenges present in the recycling sector, MRWMD is primed to utilize its resources to find new, and better, solutions for diverting materials. This article originally ran in the March issue of Waste Today. The author is the editor for Waste Today magazine and can be contacted at aredling@gie.net. Hammel says its VB 750 DK primary shredder is equipped with a more powerful Cat C13 Tier 4i engine with approximately 480 horsepower. Germany-based Hammel Recyclingtechnik GmbH announces that its VB 750 DK primary shredder is equipped with a more powerful Cat C13 Tier 4i engine with approximately 480 horsepower. According to the company, the bigger engine allows the machine to increase its output by more than 20 percent. Additionally, the shredder has been equipped with a more robust track system that allows it to navigate difficult terrain with ease, the company says. Due to the increased throughput of the machine, more material is able to be processed. In order to optimize the separation of ferrous metal, the shredder has a new track chain drive and a larger magnet to collect material. Further, the company says the shredder’s multifunctional shredding shafts give customers the opportunity to process a variety of materials. 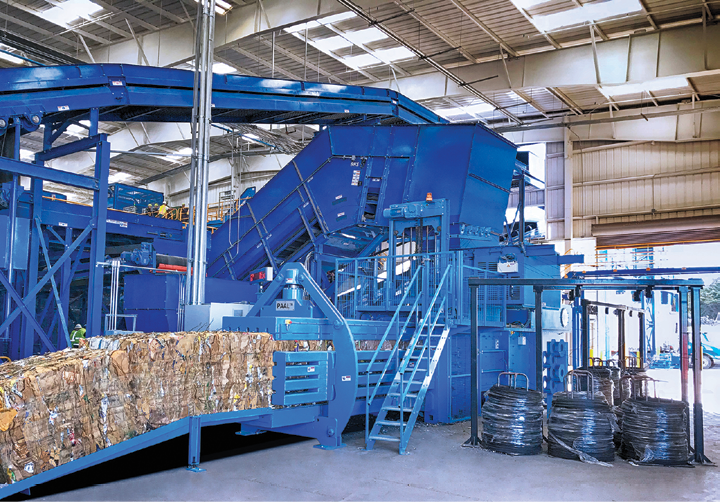 For instance, the same pair of multifunctional shafts can shred different types of waste (e.g., household, industrial or bulky waste) and wood (e.g., fresh wood and waste wood), as well as aluminum profiles and bales, light mixed scrap and tires. • A generously dimensioned radiator with two doors that allows for easier cleaning while preventing overheating. • An easy-to-use standard mobile PLC control that has three preprogrammed shredding settings and one freely configurable shredding program that allows error messages to be displayed as clear text. • A discharge height up to 4,800 mm, which facilitates higher stockpiling. • A 66-degree angle tilting hopper incline that offers an optimal filling position for the feed material.